Review of Mr Spin Mobile Casino -- Truly Mobile With 50 Extra Spins Bonus! Mr Spin mobile casino offers a wide arrangement of slots plus 50 extra spins! Is it possible to find a true mobile casino? Why, yes it is! By truly mobile casinos, we mean those casinos that operate solely on mobile devices. We've kept a beady eye on two major ones — mFortune and Pocketwin, both of which have made their mark on the iGambling industry and then some with their fantastic array of games. Now the developers of both these casinos have come out with Mr Spin. But does it hold up to the same standards as its predecessors? Read on to find out! Like we said, we've got a great enthusiasm for the mobile-first mobile casinos as their sheer simplicity makes for some sleek gaming experiences. If we had enough room on our phones, we here at Mobile Slots 4U would download all the games that are on offer Mr Spin. But that might be achievable, since it so far only has 5 games. However, after playing them all, we can safely say they are worth downloading in the first place. All Mr Spin games are available to download from your respective App store. But games aren't all Mr Spin has to offer. 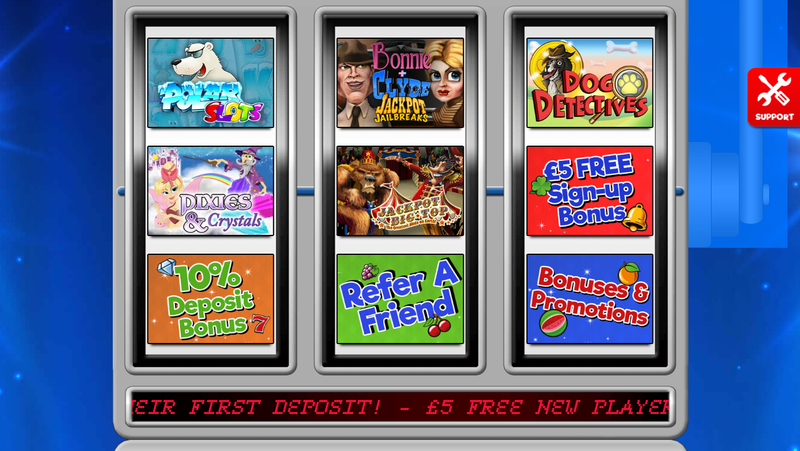 As well as a strong variety of payment methods (including mobile billing) and 50 extra spins on certain games. It's a pretty good deal, if you ask us. As we've mentioned, Mr Spin has a small amount of games — only five currently and all can be sent to your mobile to play. Five jackpot slots in total and all of them are unique and of top-quality in terms of their performance and features. However, one cannot feel but a little bit short-changed by the small amount of games available. The mobile-first philosophy is to be expected from the company that has brought us mFortune and PocketWin and it works beautifully. All the games work smoothly on 99% of all devices and all the games have their own, defining theme that makes them easily identifiable. Each game can be downloaded from Mr Spin or through Google Play/iOS App Store, meaning you don't even have to log onto the mobile casino in order to do it! All the games are jackpot slots and each title has its own maximum jackpot that can be obtained through playing. This, we'd say, makes up for the lack of numerous games. But there is always the chance that Mr Spin will add newer games as time goes on. The bonuses here are plentiful and rewarding — players get an immediate 50 extra spins when they sign up to the casino and the usual 100% deposit bonus match when they put down their first deposit. All this is more than enough to make us want to register with this mobile casino, however the extra cash earned when players refer a friend solidifies their stay. For long-term promotions, there aren't many but a long-lasting 10% deposit match on all card deposits made with Mr Spin guarantees that your account will fill up fairly quickly. Mr Spin also offers 50 extra spins when you play their games. This has to be some of the most easily attainable extra spins we've yet encountered here at Mobile Slots 4U and we advise players out there to use them well when playing this mobile casino's games. You'll obtain them once you've downloaded any one of their five gaming titles and play it for real. Most of the payment methods for Mr Spin are via Credit/Debit Cards, PayPal and Paysafecard. While we're grateful for this payment methods being available (and fairly universal) we do feel that it's rather limiting. Although, PayPal is used widely around the world. We would have preferred more mobile depositing methods as it is a mobile casino. Customer service at Mr Spin mobile casino is stellar and the runners of the website are quick and happy to help. You can contact the Mr Spin team via text, email or mobile. As soon as you access Mr Spin, you get a Support tab with all the necessary information on it. Call them on +44(0)1384 888102 or email by sending your message to [email protected] If neither of those work for you, simply text ‘HELP' to 89910 and they will call you for free. Want to play at Mr Spin? Mr Spin In conclusion, we do like Mr Spin mobile casino though we wish there were more payment methods on offer. It would be extremely helpful if they had mobile billing in particular as that would make the whole 'mobile philosophy' come full circle. There are a frustrating shortage of games, too, however what remains is of top quality and that makes up for it. The promotions and bonuses are nothing short of generous and they keep us wanting more.